Towards the end of the Revolutionary War, our founding fathers came up with a revolutionary idea of their own – a political system that did away with monarchy and instead had a democratically elected president to enforce laws and lead the armed forces as well as the federal government. 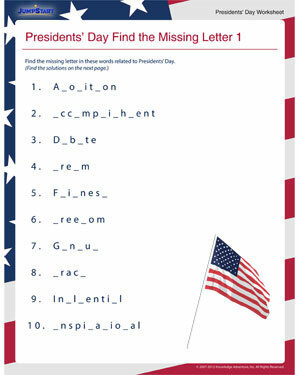 Try this fun Presidents’ Day worksheet to see how well you know your Presidents’ Day terminology. And then download or print other Presidents’ Day resources to learn some more.